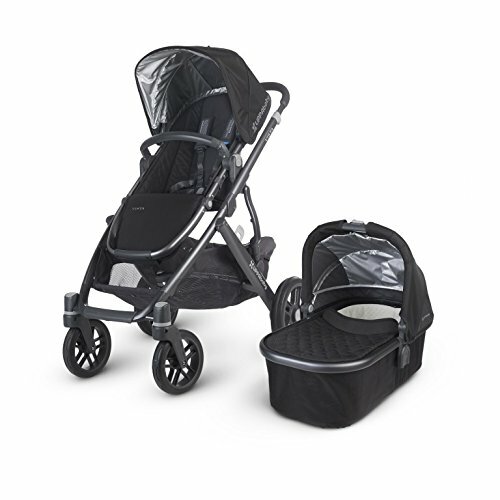 Uppababy Vista 2016 Jake Black includes carry cot, seat unit, rain covers, sun shades, insect nets and car seat adaptors. The carry cot is suitable for overnight sleeping and has a breathable water resistant mattress with an organic cotton / soy fibre outer cover. The seat unit can be used forward or rearward facing and has multiple recline positions both forward and rearward facing. The seat unit is a perfect height for pushing up to a table when out and about. Non puncture tyres and suspension on all four wheels. Car seat adaptors suitable for Maxi Cosi, Be Safe, Cybex and Kiddy infant carriers.